This work is devoted to a structural study of a highly dispersed Pd nanosystem, which is stabilized in the TiO2 matrix, by XAFS spectroscopy. 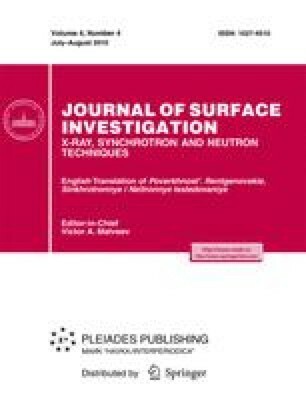 Nanocomposite was prepared from bimetallic PdCo(μ-OOCMe)4(NCMe) precursor followed by processing in several ways: calcination in air and in argon and microwave irradiation. The local structure of Pd catalysts formed by different methods was studied. Possible structural models were considered in detail. Original Russian Text © V.V. Kriventsov, B.N. Novgorodov, E.P. Yakimchuk, D.I. Kochubey, D.A. Zyuzin, I.L. Simakova, A.V. Chistyakov, V.V. Zhmakin, O.V. Bukhtenko, M.V. Tsodikov, N.Yu. Kozitsyna, M.N. Vargaftik, I.I. Moiseev, E.A. Maksimovskii, S.F. Nechepurenko, J.A. Navio, S.G. Nikitenko, 2010, published in Poverkhnost’. Rentgenovskie, Sinkhrotronnye i Neitronnye Issledovaniya, No. 8, pp. 20–24. K. V. Klementev, Code VIPER for Windows, www.desy.de/~klmn/viper.html.